Crude #6 review: A flawless finale – AiPT! Steve Orlando and Garry Brown give their Image series a perfect finale. Crude has been an underrated and overlooked gem of a miniseries from creators Steve Orlando and Garry Brown. The series has explored themes of revenge, fatherhood, acceptance, bigotry, hopelessness, redemption, and rebellion all in a tightly paced, gritty and action packed narrative set in a bleak Russian supercity. 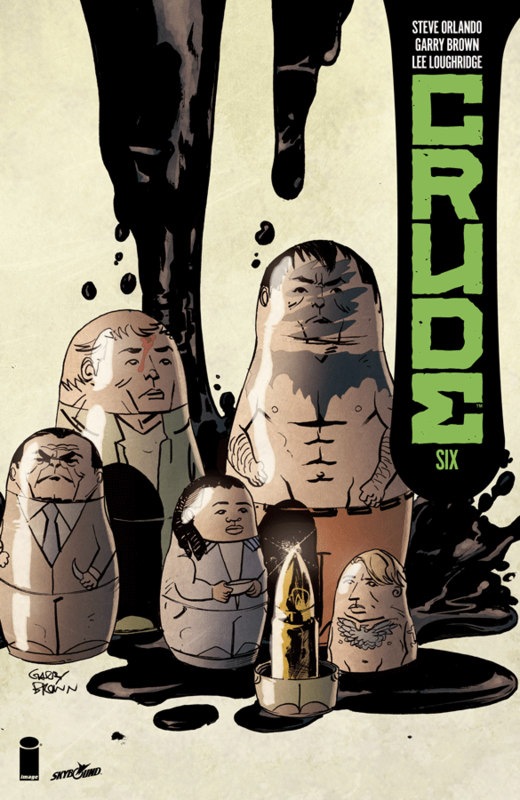 The series sadly comes to an end this week with Crude #6, however the series goes out on the highest of notes. Crude #6 is an incredible finale to the series that expertly ties all the series’ themes together for an ending that is incredibly well-paced, raw, and surprisingly hopeful. Writer Steve Orlando and artist Garry Brown do an amazing job of building a palpable sense of tension throughout this issue, as the first third of this book is devoted to the villainous monologues from Ivan Kotoshikin, a man who stands a literal personification of intolerance and bigotry. This slow burn approach to the climatic finale does a fantastic job stoking the reader’s animosity towards Ivan making the moment of confrontation all the more exciting and explosive. Ivan is a villain with multiple layers. On the surface, he’s the architect of the protagonist, Piotr’s, son’s death and the final roadblock in Piotr’s mission of revenge. On a depper level, Ivan stands for all the wrongs Piotr has encountered in his investigation into his son’s death: homophobia, false hope, intolerance, corporate greed. This complexity in Ivan’s character makes this final confrontation feel even more important — Piotr isn’t simply fighting for revenge anymore, he’s fighting for the very soul of Blackgate and, really, the idea of hope. Anyone who has read this series knows that Crude is a world utterly devoid of hope. Any glint of hope is quickly dashed away by warring factions looking to simply exploit the working class citizens. Surprisingly enough, #6 is actually an incredibly hopeful issue that demonstrates how unwavering hope pays off in the end, even when devious powers try to prey upon that hope. As Ivan, the puppet master of everything in Blackgate, spews intolerant rhetoric about how he sells Blackgate citizens’ false hope in exchange for hard labor and fake freedom, the rebellious Prava faction finally amasses in time to prove that the powers that be can no longer peddle such falsities. As Piotr pummels away at Ivan for his heinous crimes against the people of Blackgate, his newfound love and understanding for his son come full circle as he realizes that his son was the one who kept this hope alive along, this hope that has now manifested from a falsity into a full fledged revolution. This is an empowering sequence that demonstrates how true hope can never die so long as someone carries the torch. This ending is also incredibly satisfying because of how neatly it wraps up the story as everything comes full circle for an explosive finale. Without giving away too much, this story simply does a wonderful job delivering a satisfying and meaningful conclusion that really shows how the power of love, understanding, and acceptance can overcome greed, bigotry, and hopelessness. Piotr’s quest for revenge over his son’s death ends up becoming a beautiful lesson in discovery and acceptance. On top of the touching and down-right hopeful narrative, this issue is perfectly drawn. From the tension-building panels in the beginning, to the violent splash pages, to the sequential fight scenes, Garry Brown absolutely crushes every page in this book. The conversational panels display a sense of anger and unease while the explosive fights feel just as gritty and brutal as they need to be. Each splash page in this issue is gorgeous too — especially the two where Piotr delivers the final killing blows to Ivan. Brown’s art makes Piotr’s righteous victory all the more satisfying. Few series have managed to wrap-up as excellently as Crude does with this final issue. Everything comes full circle: hope is restored to the city of Blackgate and Piotr avenges his son’s death all while learning a powerful and, at times, tough lesson about tolerance and love. Steve Orlando and Garry Brown give Crude the send off it deserves with this perfect final issue. Crude #6 concludes the series with an excellently drawn and wonderfully paced finale that packs a powerful message of hope and understanding. Piotr's crusade comes full circle, from simple revenge mission to a journey of discovery, love, and acceptance. Perfectly drawn fight scenes juxtaposed with tension building sequences of calm. Ivan is a layered villain representing the worst of Blackgate, making his demise all the more satisfying. So many great splash pages!